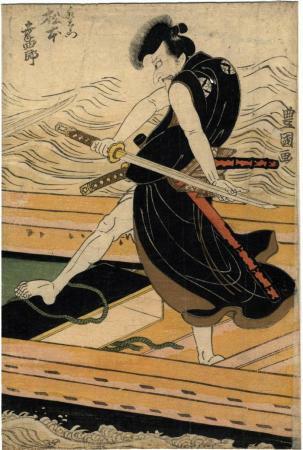 This image may represent a performance of the play based on an original play written by Chikamatsu Monzaemon in 1711. The villain of that play was Akabori Mizuemon. This may be the center panel of a triptych. There is no publisher's seal. Two panels are shown at Waseda University.